On Thursday the 3rd of October, a large group numbering around a 100 people, consisting mainly of Palestinians from the village of Burqa and the surrounding areas, as well as a smaller contingent of international activists and the press, celebrated the Palestinians’ reclamation of their land by planting olive trees on the ground of the former illegal settlement Homesh, situated on a hilltop next to the village. Upon arriving at the site, there was an initial briefing encompassing both a short history of the area, statements made by the locals concerning their grievances over the many types of harassment that had originated from the settlement over the years, as well as their hopes for the future usage of the land. This was then followed by the planting of around 40 olive trees in the area, an act which everyone present was invited to share and assist with. 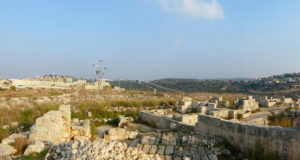 The illegal settlement of Homesh was ordered to be evacuated by the Israeli state in 2005. Despite the evacuation of the illegal settlement, the land itself was not returned to its rightful owners. As part of the Disengagement Plan, it was declared a closed military zone. This ruling was heavily enforced for Palestinians, meaning that they could not enter the hilltop, but periodically it has been blatantly overlooked with regards to Israeli settlers celebrating holy days and other events on this Palestinian land. 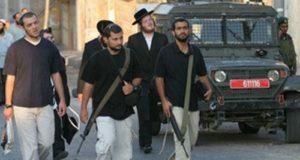 Furthermore, in addition to reports of continued Palestinian harassment by illegal settlers, petitions had been made by Israelis to re-build the settlement since its evacuation. 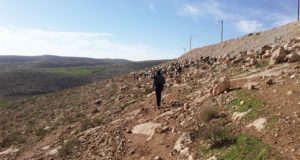 In spite of the settlement being established contrary to international law, the practical return of the land was still dependent upon a formal petition to the Israeli judicial system. The legal proceedings were thus initiated in 2010 and reached the Supreme Court by the end of the year, finally terminating in the annulment of the military zone by 2013. In 2008, pre-empting the petition and final verdict, Palestinians along with Internationals tried to reach the hilltop to plant olive trees on the land, but were violently stopped by the Israeli army, who fired stun grenades and tear gas canisters in its attempts to end the demonstration. The planting of the olive trees was more than a symbolic act, commemorating and celebrating their final victory over the illegal settlement. 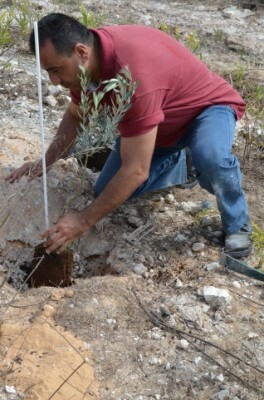 The growing of the trees also marks the return to using the land for Palestinian agricultural activity.